Today it’s rather difficult to tell a real photo from a fake one on the Internet. Mass media also usually misleads us. It happens since it’s really challenging to understand whether a picture has been Photoshopped or not. But these photo-editing gurus appeared even before Photoshop was invented and could change photos the way they wanted. In some cases, they didn’t even have to use any photo correction tools, they only had to start a rumor. GIGGAG has discovered which popular photos are fake and wants to share them with you. On social media, we often see a photo of Einstein riding a bike while an atomic explosion takes place in the background. But this picture consists of 2 combined photos: in one of them, the scientist is riding a bike near a house, and in the other picture, there’s a series of 4 nuclear tests being conducted at the United States of America’s Nevada Test Site in 1962. This photo became famous thanks to a Reddit user who posted the picture with the comment, “Women wearing shorts in public for the first time causes a car accident.” Well, it’s not quite true. This photo was staged and there were even more photos taken during that photoshoot. 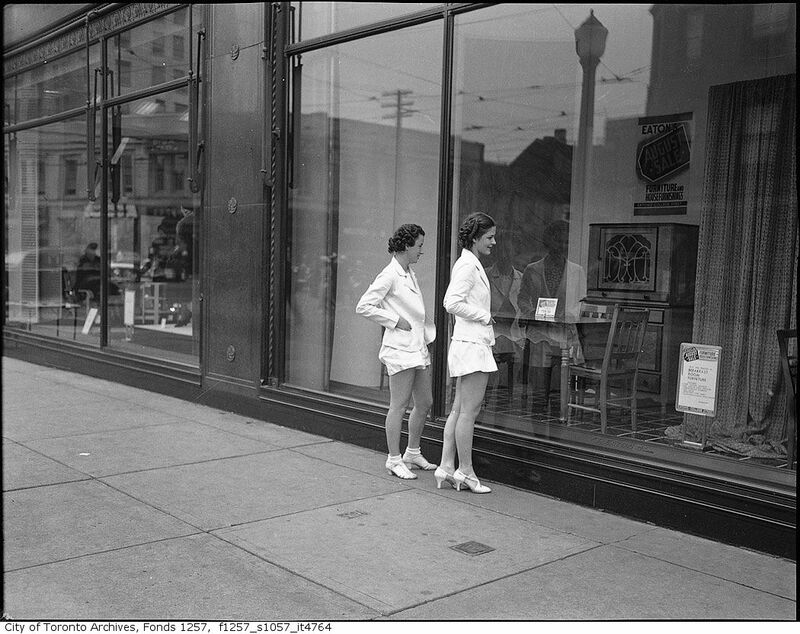 By the way, the image was taken in 1937 and shorts weren’t common quite yet, but they were certainly around. If you take a closer look, you’ll see that the car doesn’t have a single dent or scratch. Many people believed that David Bowie and Lemmy, the leader of Motörhead, were posing for a photo. But you just have to find this picture on the photo agency’s website to understand that Lemmy was actually with his girlfriend. The image claims to show General Ulysses S. Grant on horseback in front of his troops during the American Civil War. This photo was taken in a proud, invincible atmosphere and was used to encourage soldiers. But this picture is actually a fake. It was made from 3 different images. The body and the horse were “taken” from General Alexander McDowell McCook. “General Grant’s soldiers” were Confederate prisoners who had no connection to Grant at all. You’ve probably seen a picture titled “First Ambulance”, but this title is in fact, a lie. In the photo, you can see the U.S. ambulance used during the Civil War. The first ambulance as a specialized vehicle was designed by French doctor Dominique Jean Larrey who decided to re-organize the process of rescuing wounded soldiers in 1792. As an independent institution, an ambulance was formed after the disastrous fire at the Vienna Ringtheater in 1881. We all know this famous portrait of Abraham Lincoln standing near a table. But there’s only 1/8 of Lincoln in this image. The photo was stitched together from 2 different pictures and the body, in fact, belongs to a prominent politician named John Caldwell Calhoun. The funny thing is, Lincoln was against slavery and Calhoun supported this ideology. This image was considered to be Paganini’s real daguerreotype. The person in the picture is Giuseppe Fiorini, a violin maker: he created this fake photo and had been misleading people for many years. Cousins Elsie Wright and Frances Griffiths took several pictures that attracted Arthur Conan Doyle. He was a spiritualist and believed that these young ladies managed to take photos of tiny fairies. He even used one of them to illustrate his book. Later, the girls admitted that the photographs were fake and that they used cardboard cutouts of fairies copied from a popular children’s book. We all know that this legendary photo is staged. But not so many people know that it has been retouched a little. In the photo, one of the soldiers had a wristwatch on each arm, indicating he had probably been looting. One watch was removed. Technically, this photo is real and it wasn’t “Photoshopped”. We also know the name of the person depicted in the photo. But it’s still a fraud. The man is Colin Evans, an early 20th-century spiritualist medium. Once, he was performing in complete darkness when the picture was taken. All he did was jump from his chair into the air and pretended to have levitated. A cord leading from a device in his hand indicated that it was himself who triggered the flash-photograph. Many people think that these pictures of Marilyn Monroe and John Kennedy’s affair are real. But in fact, these are staged photos made by Alison Jackson who is famous for her bold pictures of celebrity doppelgangers. Did you know that these images were fake? Tell us your opinions in the comments.